Ahhh…Mother’s Day! Brings back so many memories. Raised in the South meant following traditions. On Mother’s Day all five of us would go out to the rose bushes and select a red rose. My brothers would get buds and my sister and I would pick open blooms. 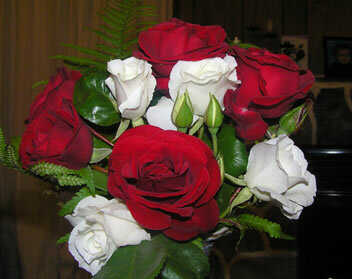 Mother would select a white rose for herself and a white bud for my father. You wore a red rose to honor your mother who was alive, and a white one for a mother in Heaven. You simply would not go to church on Mother’s Day without a rose on your shoulder to honor your mother any more than you would go to church without your gloves and hat on Easter. In fact, many (including my mother) would take extras roses and pins for those who did not have roses in their yards. Flowers and their colors were non-verbal traditions of deep beliefs. The practice was carried out on Father’s Day, at funerals and of course in weddings. It was a way of saying what you could not necessarily say to everyone. My youngest daughter was married 18 months ago and I made all the silk flowers. The grandmothers had two white roses to symbolize the two families they were bringing into the union of their grandchildren. The groom’s mother wore a corsage of two red roses, symbolic of the two grandmothers she and her husband represented. I wore a corsage of one white rose and one red rose since my mother is in Heaven and Phil’s mother is alive. No one ever wore black to weddings as that was a symbol of rejection of the bride or groom’s choice in life mate. Guests could simply look at flowers and know that grandmothers and mothers were alive even if they were unable to attend; and that by the attire of all those present in the family, that it was a happy and accepted union. Symbolism … traditions. Things we pass on as a heritage to our children. Unfortunately, many points of traditions and heritage are being scoffed at in modern times and legacies are disappearing. All the world went gaga over a royal wedding of a couple that had lived together for two years and were already married in God’s eyes. The girl wore a white dress and full veil, a slap to the meaning of purity they have stood for all these years. The last royal wedding was not sanctioned until the bride-to-be proved her purity. Yet so many Christians got caught up in the fan-fare and glamor of a royal wedding, missing the sad part of how they desecrated marriage and the church. The church sold out the sanctity of marriage for the sake of royalty. With so little value placed on marriage is it any wonder that motherhood and the value of an unborn child’s life is also devalued. The morality level of the world slips each time Christians get caught up in the world’s ways. Sadly, Spiritual traditions are fading with this trend and children are not the spiritual legacies of their former generations. Grandmothers are not bouncing children on their knees singing to them songs like, “Only A Boy Named David”, or “Build Your House Upon A Rock”. Everyone’s lost time for what matters. So many feel we have to ‘keep up with the times’ which leaves little time for traditions of Spiritual guidance. In reality, the times have not changed. There is nothing new under Heaven. God has not changed. God’s Word sets the standard for the traditions that lead to a legacy in Christ. Honor your parents … honor your mother. Your children are watching to see if you honor your parents. They will treat and honor you as they see you treat and honor your parents. Create a legacy in your children by being your parents legacy. I hope each of you gave your Mother’s a great Mother’s Day if she’s alive and that you were given one by your children in turn.